I had to check to make sure that I was at the correct address when arriving at Palmers Lodge Swiss Cottage – it looked more like a manor house than a hostel – but the address and the sign out front confirmed that I was indeed in the correct place. Palmers Lodge Swiss Cottage is a boutique hostel, with wooden features, fireplaces even in some dorm rooms, and suit of armour tucked on top of one of the sets of stairs, the hostel really tried hard to bring out its boutique nature but a home to the travellers that walked the halls. When staying at Palmers Lodge I recommend you try one of their dorms room, at least for one night. Each of the dorms are made with wooden bunk structures – and in some cases wooden stairs leading to a second level with more bunks – to continue the authentic manor house feel. They each include features such as privacy curtains, access to a power point, reading light and are queen size! Lounge areas have also been set up in some of the larger rooms; and should dorms not quite be your style there are also private rooms available. The bathrooms are my one qualm with Palmers Lodge Swiss Cottage – they are shared, sometimes co-ed and tiny (as in, you have to back yourself in to the loo because there’s no room to turn around!) The showers do somewhat make up for this though as they are modern and have good water pressure, though with the limited number available they do get quite dirty quickly. If you want to party then perhaps another London hostel might be better suited to your needs because Palmers is on the quiet side, though has a on-site bar, a pub down the road and somewhat within stumbling distance from Camden Town (around a 20 minute walk). 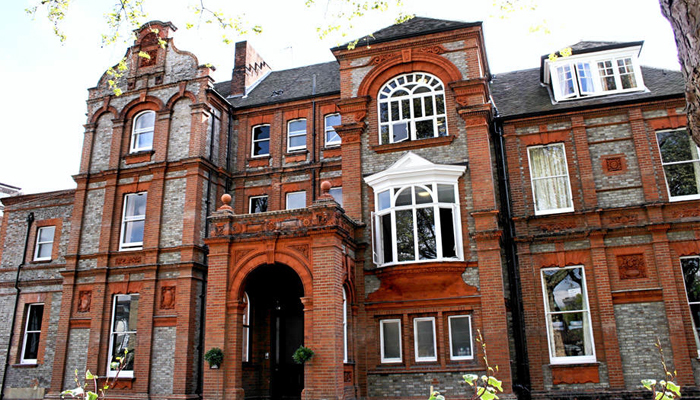 Palmers Lodge Swiss Cottage is located in Zone 2, in London’s North near Finchley Road tube station. It’s a little further out of the city than where I’d usually like to say but if you are looking for a place to relax whilst still wanting to be able to get around central London with ease then Palmers is a great choice. On-site you’ll find plenty of amenities – a bar, cafe, lounge, laundry, free WiFi or computers, and vending machines. The reception is also open 24/7 should you get locked out or need and help during your stay.